The French pavilion has dominated the Eureka Park at CES, and 2019 was no exception with the country represented by no less than 414 startups. However this year's CES saw Britain step up to the plate alongside its global counterparts, bringing along over 100 UK companies. Startups Magazine, which also exhibited in the Eureka Park, had the opportunity to meet with many of these tech startups and ask them all: why CES? They all answered the same: to secure distribution deals, to make partnerships and to be recognised alongside the best tech startup companies in the world, and gain the exposure that comes with that. The Eureka Park was host to over 1,100 startups, and while the Startups Magazine team was humanly unable to meet with them all, here are the tech startups that left a lasting impression. Startups Magazine's Daisy Stapley-Bunten and Tess Weller, interview Coline Juin, Founder of Moona at CES 2019. After a ten and half hour flight from London to Las Vegas, this French tech startup (pictured right) certainly struck a chord with the bleary-eyed, jet-lagged visitors from the UK at least. Moona is 'a smart system that understands your sleep patterns and regulates the temperature of your pillow to improve sleep quality', essentially, magic in a pillow. Say goodbye to tossing and turning, flipping over the pillow to get the 'cold side' and thrusting your foot out from under the covers. Moona is crowdfunding on Kickstarter and has currently raised over $146,031. Check out the Startups Magazine YouTube channel to watch the full interview with Moona Founder, Coline Juin. The British startup Moasure offered a seemingly obvious solution to a problem which has plagued decorators, home owners and general tradespersons for years - getting accurate measurements, easily. Startups Magazine spoke with Founder and CEO of Moasure, Alan Rock to learn more about this ingenious device. Moasure is 'the world's first motion-based measuring tool'. No more flimsy tape measures or temperamental laser measures, Moasure uses accelerometers, gyros and magnetometers 'to calculate its position in 3D space by measuring g-force and rotation'. Incidentally, this is the same technology used in rocket guidance systems - except this device even links to your smartphone in an app. Moasure measures irregular shapes like curved surfaces (you can put that string away now), it measures through walls and obstacles and it measures distance and angles at the same time. No wonder it was named hottest startup at LaunchIt CES 2019. 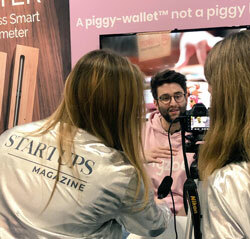 The Startups Magazine team interview Filippo Yacob, Founder and CEO of Pigzbe at CES 2019. 'A piggy-wallet not a piggy-bank', this is the tagline of Pigzbe, a handheld device shaped like a bank card which links with a smartphone app. The London-based, British startup demoed Pigzbe at CES and caught the eye of the Startups Magazine team - finally, a company teaching children about money! Pigzbe uses Wello, a digital currency based on the Stellar blockchain, which parents can top up to pay their children's allowance. Wello is a cheap and borderless digital currency solution which also teaches children about digital money. Parents have the ability to set tasks and chores, send allowances and gifts and create a family network so aunts and uncles, for example, can get involved. The app is more than a digital savings account, the app is also a 'playful interface for more advanced activities, like setting savings goals, learning about budgeting, sharing and spending. 'Managing money is a basic 21st Century literacy, that our children can't afford to miss out on,' Pigzbe states. Filippo Yacob, CEO and Founder of Pigzbe also plays the same role for Primo Toys, a startup which you may already be familiar with from our September issue in which Startups Magazine interviewed Magalie Belmo, Head of Marketing. So it's no surprise that Yacob's success and insight into educational tech for children has translated so well into Pigzbe. Pigzbe is currently live on Indiegogo, where it is taking pre-orders. The tech startup has been 214% funded. This tech startup evoked mixed emotions from the Startups Magazine team, but that was probably because one of our own is vegan and so the potential of the world's first truly wireless meat thermometer was slightly lost on her. The Meater device is reminiscent in style of a gaming stylus, except you wouldn't find anyone skewering that into a rib-eye at dinner time. The probe is coated in stainless steel with a ceramic handle and Meater claims it achieves consistent cooking results. The accompanying smartphone app offers a Smart Guided Cook system to offer cooking times and temperatures for different cuts of meat, and for whether you prefer that rare, medium-rare or well done for example. Meater is equipped with dual sensors to monitor both the internal and ambient temperatures simultaneously. The wireless range of the Meater device enables cooks, both at home and in professional kitchens, to monitor their meat while continuing with other culinary tasks. Do you ever get caught out when your phone runs out of battery? But you think, hey, don't panic, you've got a power bank in your bag. Then you discover, that's run out of battery too. It's never a happy day when that happens, and all too often results in an expensive purchase of yet another power bank or a long wait next to a group of phone charging lockers as your smartphone powers up at a snail's pace before you can use it again. Well you're going to love Quick-E (Quick Energy), a British tech startup that has developed pre-charged battery packs that come equipped with your phone's connector. That's not even the best part. This single-use battery pack is recyclable. That sounds great, we hear you say, but now I have to find somewhere to recycle the battery. The sounds like hassle. Hold your horses we haven't finished. The power bank is literally packaged in a pre-paid envelope, so simply detach it from your phone and pop it in the nearest post box. As far as we are concerned, this definitely makes it to the page of fame of the tech startups at CES that caught our eye.